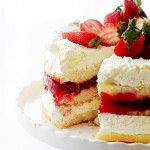 Strawberry Shortcake Cake – Layers of moist, buttery cake filled with strawberry pie filling and whipped cream frosting. 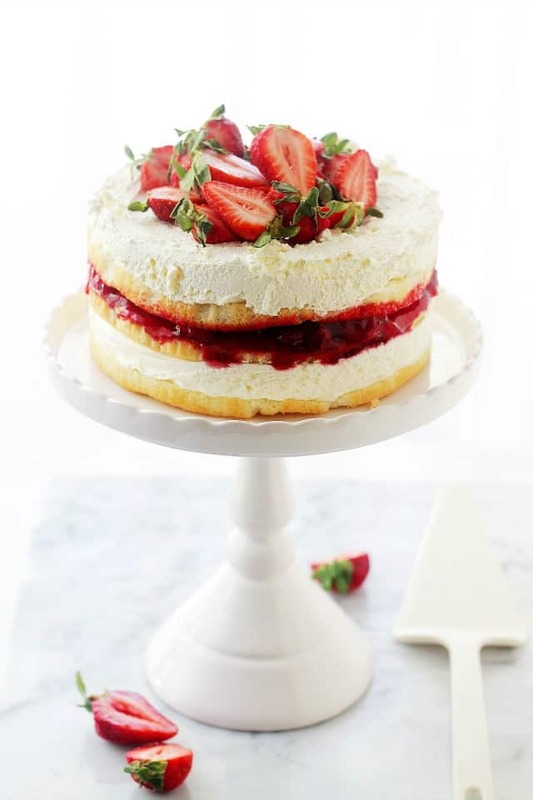 The classic flavors of strawberry shortcake in a, well, CAKE! Fluffy cake layers filled with whipped cream frosting and strawberry pie filling. Yah-ah-ah-mmm! Hi, you guys! It’s Monday!! YAY! Hope you are having a great start to the week! You know, I’ve said this many-a-times before; I can’t decorate/frost/pretty-up a cake. Not only can I not decorate it, I also can’t cut it. I tried every trick in the book; I froze the cake, I used a hot knife, I set it at eye-level, and still, I got this. BUT, as they say, beauty is skin deep and don’t judge a book by its cover. That applies to mah cake, too. 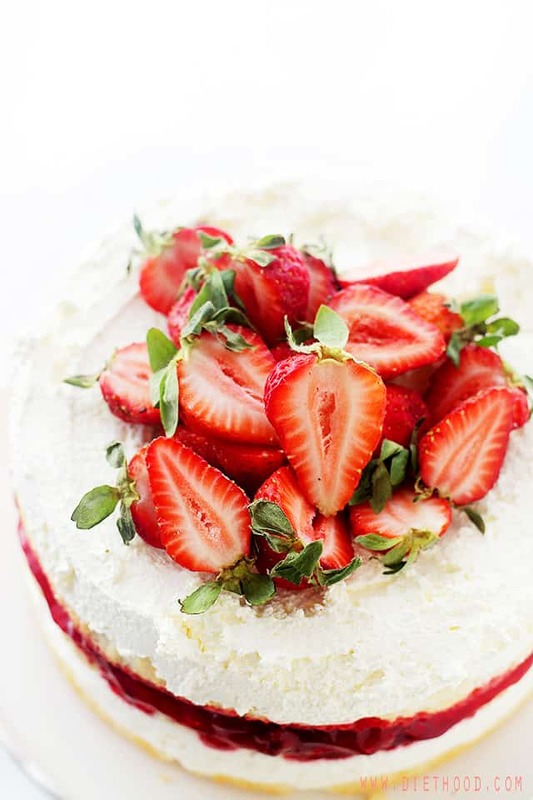 This Strawberry Shortcake Cake is so, so, SOOOO GOOD! Swear, I fought with every inch of me not to go for a third slice. Two slices were demolished in less than 5 minutes. I’m not kidding. I can do cake. I eat it better than I bake it. Also? I think I figured out the trick to cakes. Cake Flour. Yep. I know it looks obvious, I know, but it’s so much easier to just reach over for the all-purpose stuff. I mean, it’s called ALL-PURPOSE!! That means something, right?! See! Thanks for understanding. I wasn’t sure about the filling, though… I thought about going down my old route and use macerated strawberries, just as I did here with the classic Strawberry Shortcakes, but something told me to just go for it and use-up a can of my guilty pleasure… Strawberry.Pie.Filling. OH MY! Girls, boys… I CAN aaaaand I HAVE spooned an entire can of it straight into my mouth. Side note: Thank you, treadmill, for being there for me. I ♥ U! As daunting of a task as it seems to make your own cake, you really should. It’s super easy. Honestly. 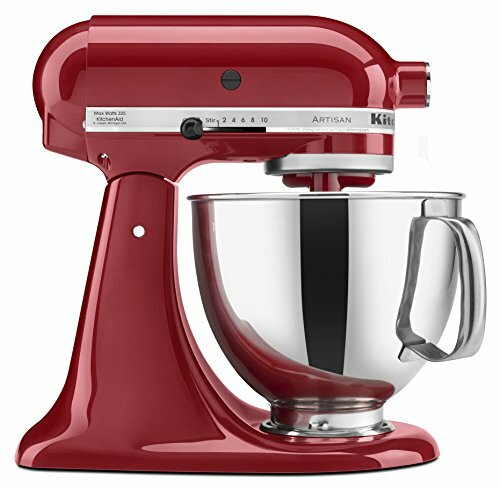 I mean, just turn on the mixer and throw things in the mixing bowl… it’s not complicated. Besides, I’m asking you to use a prepared filling… that’s big! But, it’s a holiday, so it’s okay to splurge a bit. 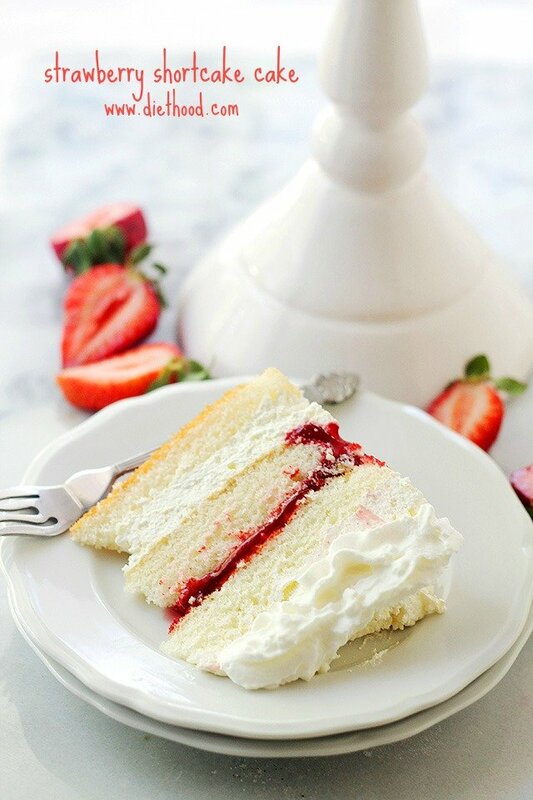 Layers of moist, buttery cake filled with strawberry pie filling and whipped cream frosting. Set oven rack in the middle. 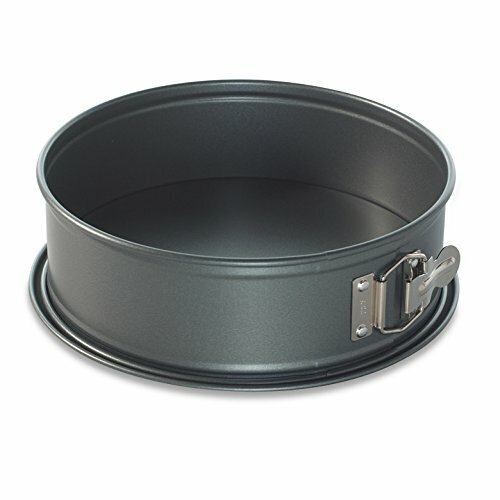 Lightly grease 2 (9-inch) springform cake pans with baking spray and set aside. In a mixing bowl, whisk cake flour, baking powder and salt; whisk until combined. Set a small saucepan over medium-high heat and add milk and butter; bring to a boil. Remove from heat and stir in vanilla and lemon juice. Set aside to cool. In your mixer's bowl, combine eggs and sugar; beat until pale yellow, fluffy, and doubled in size. With the mixer on, slowly pour in the cooled milk mixture (I suggest stirring the milk mixture before adding to the mixer); mix until well incorporated. Turn off mixer and gently fold in the flour mixture. Spread the batter in the prepared pans and bake for 15 to 18 minutes, or until a toothpick inserted in the center of the cakes comes out clean. Remove from oven and set pans on a cooling rack. Snap open the springform pans and turn our the cakes; let completely cool. In a mixing bowl, combine the whipping cream, powdered sugar and vanilla. When cakes are completely cooled, cut one of the cakes crosswise so you end up with 3 round layers. One will be bigger than the other two. Spread half of the whipped frosting over 1 of the thinner cake layers. Add the thin cake layer over the whipped frosting. Spread the strawberry pie filling over the cake. Top with the last cake layer. Spread the rest of the whipped frosting over the cake. Chill cake for 1 hour. Did you allow the milk mixture to cool down? If you added the hot mix. The recipe didn’t specify at what temperature to add the milk mixture, if you added the hot mixture you can be assured that was the reason for the flat cakes. Made this cake twice because the first time it came out really flat. My eggs were room temp and I used fresh baking powder. I beat the eggs and sugar until it was pale and twice in size. The batter seemed more abundant than the first time but sadly I pulled it out of the oven and it was flat. Won’t be making this again. Yours looks great though! Did you try assembling the cakes even though they weren’t as tall as they should have been? Did it taste okay? Sometimes if you keep opening the oven heat escapes, or if you are cooking while you have a cake in the oven those two thingss will cause the cake to flatten. Also if the eggs are to small add 1 more egg. Instead of melting the butter first beat the butter with the sugar until fluffy then add one egg at a time then add vanilla mix, make sure ingredients are not expired. whisk all dry ingredients in one bowl. In another mix all wet ingredients you now add half of flour to your butter sugar egg mixture and mix. when well combined add half of the liquid mix while mixer is on slowly so it can combine itself better once combine add the rest of the flour mix well n then the liquids like before. Baking according to directions do not open oven constantly you can check it half way into the baking however every ovens temperature is different so yours can take a little longer to bake or it might bake faster it just depends once you check on the cake rotate it slowly put the front of the cake to the back so it can have an even baking most ovens are hotter to the back of the oven also bake in the center rack if at the bottom might be to cold or to hot if you have an electrical stove on the top rack to hot heat rises. I hope this helps you. The same happened to me – it came out so flat that both cakes only equate one layer in the photo. I should have tested it before trying to make it for my son’s birthday. I did everything as instructed. This just happened to me… however this is the first time I baked a cake in Colorado… and I am used to Ontario, Canada… so I am wondering if the elevation played into it. Either way my daughter is thrilled she is having strawberry shortcake for her birthday! Thanks for the recipe! Hi, I don’t know if this will help you, (or if you’ll even see this at this point!) but I have ALWAYS struggled with cutting cakes, let alone cutting them level. The best thing that ever happened to me was combining the toothpick and dental floss methods. Take a ruler and measure out a level line around the cake with toothpicks, then take a long strand of dental floss, loop it around the cake on top of the toothpicks cross and pull through. No crumbs and the toothpicks leave such tiny holes that you don’t notice them if it’s an open side cake, and if you are frosting the sides the rough crumb fills them right in! I am having a rough time with this recipe. No matter how I do it, the lemon juice is curdling the milk mixture. What is the secret trick I am missing here!? A bit of curdling will happen and that’s nothing to worry about. It won’t hurt the cake, either. I would suggest maybe taking a whisk and whisking it a bit faster. I hope the cake works out for you! It’s really, really good! My suggestions? Have the eggs at room temperature and use cake flour and take your time. Please let me know how it goes. Oh! Thank you so much for replying! I made it last night and just put a tiny bit of lemon juice in it because the curdling was weirding me out. Lol. But, we had it today and it was delicious!! Perfect 4th of July dessert! How long can this cake stay in the refrigerator before you cut it and after you cut it ? Hi Roslin! Going by all I’ve read, you can refrigerate this cake for up to 4 days, cut or not. I hope that helps! Hi Sue! I’ve been trying to figure out why the recipe isn’t behaving for you and I honestly have no idea. This recipe is from Food Network and I have not had any issues with it. Are you using fresh baking powder? As in not expired? And, are you using cake flour? In any case, here’s the link to the original recipe: http://www.foodnetwork.com/recipes/diner-style-strawberry-shortcake-recipe.html You can also find it at the bottom of my recipe. Did you use cold eggs? The first time i tried the recipe the cake was very thin, I remembered reading something about how room temperature egg whites whip better so I took some time to let my eggs warm closer to room temperature and this time the cake rose double the size than it was the first time, I had been in a rush and wasnt able to let the eggs completely get to room temperature I think that If I had that it would have worked even better. Hi Amanda! I do always use room temperature eggs. I will make a note in the recipe about that – thank you so much for bringing it to my attention!! Is this a versatile butter cake? Does it hold up to heavier icings and buttercream? Beautiful cake, thank you. When I read the directions when taking pans out of oven to cool it says snap open and to turn our? We turn them upside down to cool, is that what you mean? Awesome thank you!! Making this for my God-daughter! Btw is 8inch springform a ok? Only have 2 of those. Thanks! Lol thank you, I will do my best! This looks amazing and I can’t wait to bake this for my hubby’s bday. Made this tonight and it was a hit! Great recipe, thx! Yum! I once made a strawberry shortcake cake for my brother’s birthday because he’s like me and would pick fruit over chocolate every day. Oh mylanta, this is one beautiful cake! Almost too pretty to eat.. Almost! 😉 I bet it tastes incredible! Imperfections aren’t a bad thing. They tell everyone of the love you put into your baked goods. As long as it tastes good, no one will ever care. And I know this tastes good. This is just heaven on a cake plate!! So gorgeous! I’ll bet it tastes as good as it looks! I think I’m going to skip dinner and just have a giant slice of this gorgeous cake! And this gets the most gorgeous cake ever award Kate! So perfect for summer! Pinned! What a gorgeous cake! From the size of your cake stand… I was thinking… I can eat this whole cake by myself!!!! 😀 SO pretty. I’d be so proud if I can make a cake like this, Kate! Lovely!! I think I need to run back to the store for more strawberries! Yay I’m not the only one who can’t cut a cake, although you’d never know from your pictures! I’m totally in love with this cake! 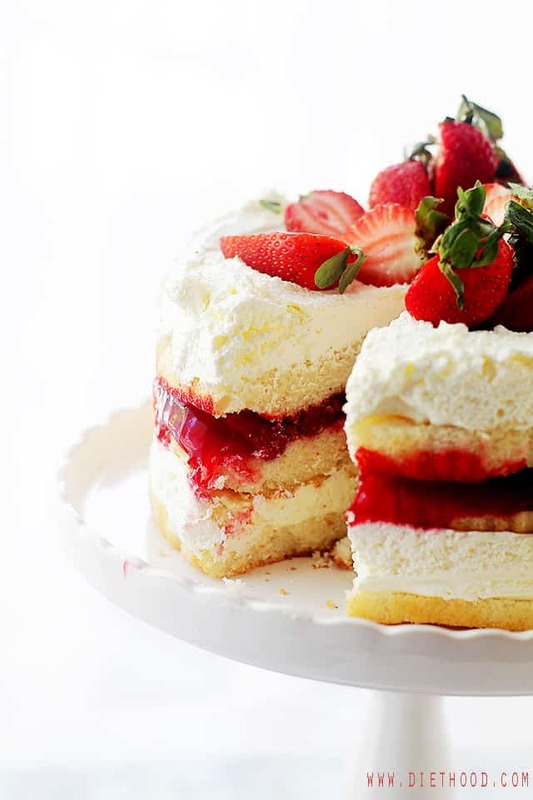 Strawberries, light, fluffy, moist cake, and whipped cream…dreamy!! Pinned. This definitely looks so mouthwatering and that’s the point right? Who cares how imperfect it looks? I feel relieved when I learnt that I’m not the only food blogger who has preblems with cake decorating and slicing. Pinning this beauty! Oh my gosh this is absolutely beautiful and ALMOST to pretty to eat. This is beautiful, Kate. What an awesome dessert for the 4th! What a masterpiece! This is stunning and you have mad skills, girlie!! 🙂 pinned! As to the blue layer … no blueberries? Beautiful and so festive! Pinned! This might be the most gorgeous cake I’ve ever seen!